The present state of American legal education raises pivotal questions: What is the relevance of legal education in a complex and global market? Has its value diminished in light of the significant investment required to pursue a law degree? Perhaps more seminal, is American legal education able to equip students with the tools needed to succeed in a global marketplace? Despite questions of value, the need for quality legal education has never been more acute. The global market needs professionals who can think critically and provide innovative solutions to complex problems. American legal education has long addressed this need. The current challenging times for legal education have prompted us to think more creatively about pedagogy and curriculum. The academy’s continued evolution has led to more dynamic programs that produce adroit professionals who can better function in a complex, more diverse market. Many of the new programs that have emerged during these challenging times explore the intersection of classroom doctrine and real-world problems. Other innovations seek to add value and manage costs. The array of new programs underway continues to expand. At the same time, law schools continue their vital roles both innovators and as critics of law through the scholarship that their faculty members produce. Challenge has truly prompted innovation. Law schools and faculties should work to foster the dynamism that comes from the academy’s continual evolution. Although the challenges confronting law schools are significant, the resolve to meet them has never been stronger. The AALS Exhibit Hall gives attendees the opportunity to learn about new products, services, and technologies available to the legal community. The Exhibit Hall also serves as a Meeting Place for attendees to interact and exchange ideas and includes a lounge area with coffee, tea, pastries, or cookies served in the mornings and afternoons. In addition, exhibitors will also have an exclusive hour on Friday, January 8 from 3:30 p.m. to 4:30 p.m.
Wednesday, Jan 6, 2 p.m. – 8 p.m.
Thursday, Jan 7, 8 a.m. – 6:30 p.m.
Friday, Jan 8, 8 a.m. – 5 p.m.
Saturday, Jan 9, 8 a.m. – 2 p.m. Need help finding a meeting room? Have a question about when and where a program or reception is taking place? Have a question about any of AALS services at the Annual Meeting? Stop by the information desk near AALS Registration. We are here to help. Are you a section chair with a question about your program, logistics or want to provide a speaker update for your program? Stop by to talk with an AALS staff member during the dates and times listed further below. Print out your name badge and pick up your materials at AALS Pre-Registration Desk at the self-check-in kiosks. Do you need to register for the meeting or purchase a meal event ticket? Stop by AALS On-Site Registration. Thursday, Jan 7, 7 a.m. – 7 p.m.
Friday, Jan 8, 7 a.m. – 7 p.m.
Saturday, Jan 9, 7 a.m. – 7 p.m.
Sunday, Jan 10, 7 a.m. – 10 a.m.
Each speaker ready room will be staffed by a law student assistant. To simulate the actual meeting room, the speaker ready rooms will be set theater style with a podium, head table and LCD projector and screen. Speakers will be able to test their PowerPoint presentation, using the LCD projector. Please bring your laptop. Each speaker ready room will also have a printer should you need to print a set of your presentation notes. Admission to all programs requires your AALS name badge. The Business Center is located on the 2nd floor. Private work stations with full internet access available. Other services include fax, photocopying and printing. It is accessible after hours with guest key card. Hours of operation at 7 am – 7 pm Monday through Friday; 9 am – 5 pm Saturday and Sunday. Telephone: (212) 586-7000 ext. 5212; Fax: (212) 315-1374. The FedEx Business Center is located on the lower level of the hotel. This is a full service business center. After hours, hotel guest may access the business center with room key. With a valid credit card, guest has access to use a laptop, print documents, make copies, and fax documents. Its hours of operation are from 7 am to 8 pm, 7 days a week. The telephone extension is 6462. Children Badges – Come to the AALS Registration Desk and ask for badges for your children. These colorful badges will provide your children access to program sessions. There are additional fees for children to attend meal events. AALS does not provide childcare services onsite at the conference. Consult with the hotel concierge for more information. The AALS will have a photographer and videographer at special events, sessions, exhibits and throughout the hotel common areas used for the Annual Meeting. Photos and videos taken during the Annual Meeting will remain the property of the AALS and may be distributed or used in future marketing materials. Your attendance at the Annual Meeting indicates your acceptance to be photographed, filmed, or recorded, and to the AALS’s use of your image, without payment of any kind, in program(s) and for other purposes designated by the AALS in the future. The 2016 AALS conference offers attendees over 200 sessions on a wide variety of topics on the legal profession and legal education. In order to streamline the confirmation of attendance to the sessions, we ask each attendee to record his/her participation by signing the CLE sheet located at the back of each session room. If you are unsure of whether or not you signed a session CLE sheet, please visit the AALS Information Desk located on the third floor of the New York Hilton Midtown. Staff can manually add your name, provided you bring a witness to your attendance at the session in question. Attendance cannot be changed on any CLE sheet after the conclusion of the Annual Meeting. We ask you to please silence your electronic devices during the meeting sessions. Open web browser and you will see the StayConnected Welcome Page. Use promotional code AALS2016. Go to settings on your device, click on “Sheraton Guest Room Wi-Fi”, and enter passcode AALS. Open web browser and select “Hilton Meeting Room WiFi” and use promotional code AALS2016. Go to settings on the device, click on Sheraton Meeting Wi-Fi, enter passcode AALS. Easily view schedules, maps, exhibitor lists, and social features on your phone or tablet. You will also be able to create your own schedule of sessions you are interested in attending, provide feedback after each session by filling out the surveys and email notes. The mobile app contains the most current information, including all of the late changes not included in the printed program. To download, visit the Apple App Store or Google Play Store and search for AALS2016, install and run. Once the app is downloaded, no internet connection is required. This year’s meeting, the 110th Annual Meeting of the Association, is packed with programs to appeal to law school deans, faculty, and administrators. See the full program schedule for detail descriptions and speakers. Opening Plenary Program includes two of the three authors of the joint essay Lawyers as Professionals and Citizens: Key Roles and Responsibilities in the 21st Century with speakers Benjamin W. Heineman, Jr., Former Senior Vice President for Law and Public Affairs, General Electric and David B. Wilkins, Harvard Law School. Their essay presents a practical vision of the responsibilities of today’s lawyers as both professionals and as citizens. The program is on Thursday, January 7 and replaces the former AALS Luncheon. Opening Reception to conclude your day on the first full day of the meeting. Enjoy drinks and light appetizers while mixing and mingling with your colleagues from law schools across the country. The reception will be held in the Grand Ballroom of the New York Hilton, which is also the AALS Exhibit Hall. We hope attendees will also enjoy visiting the exhibiting companies during the reception to learn about new products and services available to the law school community. We are pleased to welcome special guest Michael R. Bloomberg, Former Mayor of New York City who will make brief remarks and attend the reception. Workshop for Pretenured Law School Teachers of Color, this workshop typically offered in June, will now be part of the Annual Meeting. Minority law teachers face special challenges in the legal academy, starting from the first day of teaching. 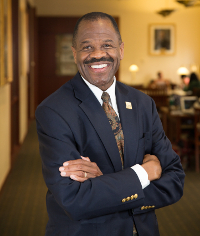 At this workshop, diverse panels of experienced and successful law professors will offer ways to successfully meet these challenges as they arise in the context of scholarship, teaching, service, and the tenure process. Click here to view the POC E-Brochure. Arc of Career programs, specifically designed for faculty at various stages of their law school careers. Building a Better AALS: A Conversation with the AALS Executive Committee, a unique opportunity to share your suggestions directly with members of the AALS Executive Committee. Discussion Groups programs, a space designed to facilitate scholarly discussion and engagement about topics of interest among small group of faculty. Academy Programs, these are open submission programs selected through a call for proposals. This is just a sampling of speakers for the Annual Meeting. Please see the full program here to see all the outstanding speakers on the program. Welcome to the 2016 AALS Annual Meeting in New York City! Below you will find detailed information regarding registration, fees, and logistics. Please take time to review the FAQ page, which provides answers to many common questions. If you have additional questions email our registration team. The Institutional Advancement registration fee includes admission to only Section on Institutional Advancement sessions, the Exhibit Hall, and the Institutional Advancement Sunday, January 10 Luncheon. Law school professional staff attending only the Institutional Advancement program are eligible for and this reduced registration rate, but law school faculty are not eligible for this fee. Opening Plenary or Opening Reception, should pay the full registration fee and use the regular registration form. Attendees may either register on-site at the Annual Meeting Registration Desk in the Grand Ballroom, Third Floor, New York Hilton Midtown starting Wednesday, January 6, 2016 or online themselves through their AALS account. A $50 on-site fee will be assessed for registrations made on or after January 1, 2016. Questions about on-site registration can be directed to 212-333-6350. If paying by credit card, AALS accepts Visa, MasterCard, and American Express only. We recommend that you submit your credit card information using our secure online registration system. Please note that credit card payment processing time for registration forms submitted by fax or regular mail may take up to one week or more. For the first time we are offering a discounted registration fee for all New Law School Faculty (teaching less than 3 years) and Emeritus/Retired Law School Faculty. No code is required, simply choose this registration type at checkout. If registering by fax or regular mail, an email confirmation will be sent once your registration has been processed. If you would like a copy of your confirmation to be sent to another party, you may select this option whether you register online or use the paper form. A refund of all registration fees, minus a $25 processing fee, will be issued to all cancellation requests which have been submitted in writing by December 15, 2015. Cancellations received after this date, as well as no-shows to the Annual Meeting, are not eligible to receive refunds of registration fees. Cancellation requests can be made by email or regular mail to: AALS Registration, c/o Erick Brown, 1614 20th St. NW, Washington, DC 20009. Find the solutions, products and services to help you in your role and your law school. Click links and learn more about our Exhibitors. To inquire about AALS exhibits opportunities, please contact Mary Cullen at mcullen@aals.org. AALS would like to express its gratitude to the following organizations and law firms for their generous support of the many goals and activities of the AALS including the 110th Annual Meeting. Their contributions and commitment to our mission are essential to the efforts of AALS to uphold and advance excellence in legal education. With their support, we are able to bring an Annual Meeting strong in professional development programs and networking opportunities for the benefit of all our members. William S. Hein, Co., Inc.
We would like to thank the following for their donations of up to a $1000 to AALS in 2015. View the prospectus for the 110th Annual Meeting here. To inquire about AALS sponsorship opportunities, please contact Mary Dillon Kerwin at mkerwin@aals.org, (202) 759-9214 or (703) 399-0855. AALS is committed to making our meetings and events accessible to all of our attendees. Please contact the AALS at accommodations@aals.org no later than December 6, 2015 so that we may assist you with services that you need. AALS will provide a room with electrical power, a refrigerator and a locking door for nursing mothers who attend AALS meetings. Please visit the AALS Information Desk for access to the room. accommodations@aals.org in advance. Every effort will be made to set meeting rooms/locations to accommodate all attendees, both speakers and audience members. Because the Annual Meeting has numerous programs, there can be considerable distances between meeting rooms. If you are a regular wheelchair user, we suggest you bring your chair with you to the meeting. Should you require an aide or personal assistant to help navigate the Annual Meeting, AALS will register your aide as a complimentary guest. Please contact accommodations@aals.org to register your personal aide (name, city and state is required for the badge which can be picked up at AALS Registration.) Personal aides may attend sessions and AALS sponsored meals. If you need AALS to arrange for an aide to help you navigate the meeting, please email your request to accommodations@aals.org or call (202) 296-4755 to outline the specific type of assistance required. In order to best accommodate your request, we ask that you notify us of your request as much in advance of the meeting as possible. Sign Language Interpreters: Attendees may request a sign language interpreter for the AALS Annual Meeting. Please email your request to accommodations@aals.org by December 6, 2015. Sign language interpreters are provided for AALS-sponsored events only. CART: Communication Access Real-time Translation (CART) is a word-for-word speech-to-text interpreting service for people with a hearing loss or who would otherwise benefit from this accommodation. Attendees may request CART service for the Annual Meeting. CART will be provided for AALS-sponsored events only. Please email your request to accommodations@aals.org by December 6, 2015. ADA-designated hotel rooms in the Annual Meeting hotels will be specifically set aside for individuals requesting them. Please notify hotel of your request as much in advance as possible as late notice may be difficult to accommodate based on occupancy level. ***ATTENTION***: 12-17-15 – AALS Official Housing is now closed for reservations. For changes, cancellations and new reservations, contact the hotels directly starting on December 22nd. Important: Please make sure you verbally confirm the room rate with the hotel as all hotels must honor the negotiated AALS convention rate if the hotel still has availability in the AALS block. Be sure to ask for “In-House Reservations” at all of the hotels. The room rates per night for single and double occupancy are provided below; applicable taxes apply. The AALS 2016 Annual Meeting will be held in New York City at co-headquarter hotels, the New York Hilton Midtown and the Sheraton New York, located across 53rd Street from one another. Both co-headquarter hotels will host AALS programs and meals as well as law school and other organization events. Guest rooms are also available at the Marriott Marquis and Renaissance Times Square; both hotels are located in Times Square. All four hotels are 100% non-smoking. The co-headquarter hotels are located between Central Park and Times Square, within walking distance of such iconic attractions as Central Park, Radio City Music Hall, MOMA, and Broadway. The Sheraton New York is newly refreshed from a recent $180 million renovation. For details about each hotel property and their amenities, visit the hotel’s website. Reservations may be modified or cancelled after receiving your acknowledgement. Until 5 p.m. CST December 17, please make changes and cancellations online using the link, email address or fax number provided in the acknowledgment email. No cancellations will accepted by phone. For hotel room reservation modifications or cancellations after December 17, please wait until December 24 and contact the hotel directly. Beware Housing “Pirates” and “Poachers”! When AALS secures sleeping rooms at hotels for our Annual Meeting (commonly referred to as room blocks), we research the properties to make certain that our attendees will be adequately accommodated. The room block is established to ensure that sleeping rooms meet our standards and are offered at the discounted price. We have been informed that registrants are being contacted by fax, e-mails, and phone calls with offers for cut-rate housing. The intent is to convince you that the offer is made on behalf of AALS, or that the soliciting company is a viable alternative to going through our service provider. This is not true. Housing for the AALS Annual Meeting is handled exclusively by our selected housing service, Experient, through online booking only. How You Can Help? Don’t be misled! If you are contacted by anyone asking if you need a room for the Annual Meeting, please do not make a reservation or provide a method of payment. We ask that you get as much information as you can about the caller and pass it on Mary Cullen, AALS Meeting Manager, at (202) 296-8851 or mcullen@aals.org. For those traveling by air, the City is served by seven area airports. Of these, three are major hubs: John F. Kennedy International Airport (JFK) and LaGuardia Airport (LGA) are both in Queens, while Newark Liberty International Airport (EWR) is located in neighboring New Jersey. These three airports provide access to the City via taxis, buses, vans, subways, trains and private limo car services. JFK is 15 miles from Midtown Manhattan. It handles the most international traffic of any airport in the United States—more than 406,000 flights and 50.4 million–plus passengers annually. About 7,600 weekly domestic arrivals/departures connect to JFK, and 80 airlines serve its six passenger terminals. LaGuardia is on the northern shore of Queens and is the closest airport to Midtown Manhattan at about 8 miles away. It handles domestic US flights and shuttles, and Canadian and Caribbean air traffic, with 338,500-plus flights and 26.7 million passengers annually. Its four passenger terminals serve more than 6,955 weekly arrivals/departures. Public bus: fare is $2.75 for the M60 bus between LaGuardia and Manhattan’s Upper West Side (106th Street and Broadway); 45–60 minutes. For subway connections from the airport into town, board the express Queens Q70 bus and disembark at the 82nd St./Jackson Heights subway station (for the 7 subway line) or the Jackson Heights/Roosevelt Ave. subway station (for 7, E, F, M or R subway lines); add 15–20 minutes for the subway ride. Newark Liberty welcomes more than 414,700 flights and almost 35 million passengers annually. There are more than 29 international and domestic carriers, with more than 7,700 weekly domestic arrivals/departures. The airport is across the Hudson River from New York City, 16 miles and 45–60 minutes from Midtown Manhattan. In addition to nearby airports, New York City is easily accessible via an extensive network of bridges, tunnels, ferries, trains, light rail, buses, heliports and even cruise ports. Driving to the City is an option, but you certainly won’t need a car to get around—the fastest, easiest way to reach virtually every NYC attraction is by foot and the City’s energy-efficient 24-hour public transit system. The best way to get around NYC is through a combination of walking and mass transit. NYC’s extensive system of subways and buses are operated by the MTA (Metropolitan Transportation Authority). The system is inexpensive, operates 24/7 and provides a fun way to extend sightseeing, and it gets you where you need to go—fast. Other interborough connections include ferries and even an aerial tramway. Getting an MTA MetroCard is your first step to navigating the City by subway or bus. A MetroCard is required to enter the subway system, while exact change or a MetroCard can be used on buses. You can purchase a MetroCard at any subway station from multilingual machines (which accept cash, and credit and debit cards) or booth attendants. An unlimited MetroCard enables users to ride all subways and buses as often as they like and costs $31 for seven days or $116.50 for 30 days. Additional discounts are available for seniors age 65 and older, and disabled riders. For a map of New York City’s subway and bus system, click here. The City’s fleet of taxicabs is regulated by the NYC Taxi & Limousine Commission (TLC). Taxicabs operate 24 hours, provide door-to-door service and accept cash or credit cards. The City’s famous yellow fleet is primarily seen throughout Midtown but can be hailed for trips to other boroughs and even to other states. NYC’s new apple-green Boro Taxis can pick up hails in the Bronx, Brooklyn, Queens (excluding the airports) and Staten Island, plus northern Manhattan (north of West 110th Street and East 96th Street); they are not authorized to pick up any trips elsewhere in Manhattan. To hail a taxi, stand at the curb and look for a yellow cab with an illuminated white number on top. Off-duty cabs display the illuminated words “Off Duty” on the same sign. Board and exit the cab curbside. For yellow or green taxis, there is a minimum meter fare of $3, and prices increase based on the distance and duration of the trip (assume prices are higher during peak rush-hour traffic). Surcharges apply to the meter price nightly, 8pm–6am, and Monday–Friday, 4–8pm. Drivers appreciate a 15–20 percent gratuity at the end of a trip. Bridge and tunnel tolls are not included in the taxi’s metered fare. For further details, visit NYC.gov/taxi or call 212-NEW-YORK from outside the City or 311 when in town. ShuttleFare.com is offering a $5 discount off airport shuttle transportation to and from the airport and your hotel if you book a flight on their website with the Discount Code “AALS2016”. New York City’s tremendous energy, excitement and diversity set it apart from all other destinations on the planet—and that’s no overstatement. Take in the dazzling lights in Times Square and breathtaking views of our famous skyline from Top of the Rock Observation Deck or the Empire State Building; experience celebrity-studded theater on and off Broadway, visit renowned art museums and monuments, stroll tranquil green expanses in parks citywide and choose from a wide array of major league sports; indulge in incredible shopping and enjoy sumptuous meals; and witness major events like the Times Square ball drop, NYC marathon, Macy’s Thanksgiving Day Parade and Fourth of July Fireworks. With five boroughs—each with many neighborhoods—comprising the City of New York, there’s so much to do and see year-round. People, communities, businesses and architectural development are often in flux here so, whatever your tastes or interests, there’s always something new to discover in New York City. This Delegate Discount Pass is your ultimate guide to exclusive savings throughout the City. Redeem this offer by showing a printed or mobile version of the NYC & Company Delegate Discount Pass in its entirety at participating member restaurants and attractions, unless provided with a promo code for advance reservations, purchase or registration. Before you even get here you may have an image of the City as the setting for numerous movies and books, but once you arrive you see that the fame is rightly due. With five boroughs, each with remarkable landmarks, from the Statue of Liberty to Ellis Island, Coney Island to Times Square, the United Nations to the Empire State Building, it is clear why the City’s sights represent America to the world. You can certainly visit the most famous attractions, but consider wandering a little farther into all five boroughs to discover wonderful surprises in diverse neighborhoods such as Brighton Beach in Brooklyn, Arthur Avenue in the Bronx, Flushing in Queens, St. George on Staten Island and the Upper West Side of Manhattan. With endless places to explore, you’ll have no problem filling your free time and entertaining your family. Plus, getting around NYC is efficient and affordable with its extensive mass transit system, 24/7. Hail a cab, rent a bike, hop a ferry, board a bus or take the subway to everywhere. This is the city of retail, with great discounts, variety and abundance. There’s no city or state sales tax on clothing and footwear under $110, and savings can always be found on photography and electronic gear. Discover artists’ works on the streets of SoHo or in Chelsea art galleries, find that special trove at flea markets in Hell’s Kitchen and at Brooklyn Flea, purchase Asian delicacies in Flushing, Queens, or Italian imports on Arthur Avenue in the Bronx. Try on vintage clothes in Williamsburg, Brooklyn, or browse designer boutiques in the Meatpacking District. The City is also home to world-renowned flagship stores like Apple, Tiffany & Co., Saks and Bloomingdale’s. It’s impressive how easy NYC is to shop till you drop—without dropping all of your hard-earned cash. Be sure to come with room in your luggage or an extra bag for all the must-have goodies you’ll want from New York City. Check in regularly for up-to-the-minute discounts and offers and free-in-NYC events at nycgo.com. New York City is an exciting destination for all. The City is home to diverse neighborhoods, historic landmarks, glamorous clubs and some of the best museums in the world. New York City comprises several islands, and its waters are home to an extensive ferry system to take you uptown and downtown, as well as across the rivers between boroughs. Perhaps the best-known transport is the Staten Island Ferry. It’s primarily a commuter shuttle between Staten Island and Lower Manhattan, but it’s also a wonderful 5.2-mile, 20-minute mini-cruise with great views of the Statue of Liberty, New York Harbor and Lower Manhattan—plus it’s free. Other shuttles include New York Water Taxi and NY Waterway and other services are available, too, such as harbor and sightseeing cruises like Statue Cruises, operating direct service from Battery Park to the Statue of Liberty and Ellis Island. If you love to shop, choices abound. Midtown offers top-name fashion spots like Macy’s, Saks Fifth Avenue and other big-name department stores; SoHo, TriBeCa and NoLIta feature celebrity designer goods, handmade jewelry and artwork; and Williamsburg, Brooklyn is a fun place to find one-of-a-kind vintage apparel in charming boutiques. For culture and entertainment, consider NYC’s remarkable museums and the bright lights of Broadway at the Theatre District in Times Square. Night owls can party at cocktail lounges in Chelsea and dancing dens in the Meatpacking District. There’s also cabaret and karaoke in Times Square, comedy clubs in Greenwich Village and Long Island City, and rock and roll venues on the Lower East Side. Foodies who want to savor delicious, authentic cuisines from every region in the world should head to Astoria or Flushing in Queens, the East Village in Manhattan, and Cobble Hill in Brooklyn. A visit to Yankee Stadium in the Bronx, the Mets’ Citi Field in Queens or their minor-league teams—the Staten Island Yankees and Brooklyn Cyclones—is a must for all baseball lovers. While you’re in NYC, follow NYCGO on Twitter and Facebook for daily events, tips and deals. Or head to nycgo.com for a list of mobile applications you can download on your smartphone to help you explore NYC with ease. New York City weather can vary from day to day, and even morning to afternoon. The winter months (December–February) are cold and snowy with less daylight, though the sky is often sunny, blue and clear. New York City is in the Eastern Standard Time Zone (Greenwich Mean Time minus five hours during daylight saving time, from March through November, and minus six hours the rest of the year). Check here for the current date and time in NYC. If you’re visiting New York City from outside the United States, you may need a visa to enter the country. For details, visit the US State Department’s visa information website. It’s worth noting that if you’re having drinks at a bar, bartenders typically expect a $2 tip for every drink they serve you. Later, when the bar gets crowded, you’ll be glad that the bartender remembers you! New York City is committed to ensuring accessibility for everyone with special needs, and has equipped all buses with lifts for those in wheelchairs and those who have difficulty climbing stairs. In addition, many subway stations include elevators, ramps, visual display signs, accessible public telephones, and tactile and audio features on vending machines. Subways also have automated voices indicating stops, and all buses and select subway stations are wheelchair accessible. Many street-hail taxicabs accommodate wheelchairs. To request a wheelchair-accessible taxi, call the accessible dispatch center at 646-599-9999; text a request to 646-400-0789; or download the free mobile app “WOW Taxi” at the Apple App Store. Passengers with disabilities are eligible for reduced fares on most mass-transit trips. For more information about NYC accessibility, call 212-NEW-YORK from outside the City or 311 while in town; contact the Mayor’s Office for People with Disabilities (212-788 2830, TTY: 212-504-4115, NYC.gov/mopd); or visit NYC & Company’s accessibility section. What are this year’s registration deadlines? No, we do not offer a one-day registration or per-session fee. Registration is for the entire Annual Meeting, except for the registration fee for the two-day program offered by the Section on Institutional Advancement. As a full conference registrant you will have access to all Annual Meeting programs, including AALS and Section programs, panels, receptions, and other programs more fully described in the 2016 Annual Meeting Brochure. What is Institutional Advancement and who should register for it? This registration is limited to law school professional staff only attending the two-day program of the Section on Institutional Advancement. It does not include other Annual Meeting programs or events. This year, Institutional Advancement attendees have the option to register online or submit the Institutional Advancement paper registration form by fax or regular mail. Your username is typically your school-affiliated email address. If you have never used online registration before, you should first contact your Dean’s Office to ensure you are listed on your school’s AALS Roster for the Directory of Law Teachers. For further assistance with this process you can email AALS support. For all other questions about signing in please email registration. We strongly encourage online registration using our secure website. We offer the option to submit a paper registration form (PDF) by fax to (202) 872-1829, or regular mail (using check or credit card payment options). Mailed submissions of the paper form should be sent to: AALS, 1614 20th St. NW, Washington, DC 20009. Please note that we no longer accept submission of registration forms by email. In order to meet Payment Card Industry Association (PCIA) standards the AALS can no longer accept credit card payments by email. We recommend that you take advantage of our secure online registration system. We are happy to provide assistance and answer any questions that you may have concerning this change. What is the cancellation policy for the 2016 Annual Meeting? Cancellations must be made in writing and sent by email to registration@aals.org, fax to (202) 872-1829, or by regular mail to: AALS Registration, c/o Erick Brown, 1614 20th St. NW, Washington, DC 20009. A refund of all conference fees paid, minus a $25 processing fee, will be issued for requests that are submitted by December 15, 2015. Cancellations received after this date, as well as no-shows for the Annual Meeting, are not eligible to receive a refund of conference fees. A written authorization to AALS using one of the above methods. Please include your wish to cancel and transfer your registration, as well as the name of the individual you would like the registration to go to. Submission of a paper registration form (PDF) for the substitute registrant. Please submit only by fax or mail if including any additional payment information by credit card. How can I request Access-Related Accommodations for the Annual Meeting? For information on access-related accommodations please visit the Accessibility webpage (by clicking the “Accessibility” tab on the left). For further information, contact AALS accommodations at accommodations@aals.org so we may assist you. Most programs at the Annual Meeting are planned by one of the one hundred sections. Programs marked Call for Papers, include at least one presenter selected on the basis of a call for papers. Programs marked as a Law Review Published Program will have their papers published in a law review. The Program Committee for the 2016 Annual Meeting selected Academy, Crosscutting, Discussion Groups, Hot Topics, and Symposia programs from proposals submitted by law school faculty; the AALS Task Force on Professional Development selected Arc of your Career Programs. [New] Academy Programs – programs submitted by faculty that do not fit into any of the other program categories. [New] Arc of Career programs – specifically designed to help law faculty with professional development over the course of their law school careers from pre-tenure, to reinvention at mid-career, to retirement. Crosscutting Programs – focus on multi-subject and interdisciplinary subjects and seek to offer new perspectives on legal issues. [New] Discussion Group – program sessions that provide a setting for an in-depth discussion of topics by a smaller group of participants. Hot Topic Programs – late-breaking issues of general interest. Symposium – a day-long opportunity to examine a specific issue topic in greater depth than is possible during a regular panel program. Pedagogy Programs – section programs on pedagogy designed for new law school teachers. Works-in-Progress Programs – section programs in which senior law scholars assist junior scholars ready their scholarship for submission to law reviews. What events require an additional ticket purchase at this year’s Annual Meeting? Why is the AALS Luncheon not listed in the program? The AALS Luncheon has been replaced by the AALS Opening Plenary Program, which will be held on Thursday, January 7 from 9am -10am. This change allows all attendees to hear the meeting’s keynote speakers without having to incur the expense of a hotel lunch. How can I purchase a ticket for meal events or field trips? You are welcome to purchase your meal event or field trip ticket when you submit your initial registration. You may also add a ticket purchase to your registration once it has been completed using online registration or a paper form (PDF). Advance purchase of your ticket is recommended, as they will only be for sale on-site until the close of business the day prior to each event. To follow Payment Card Industry Association standards, tickets will not be sold at the door. I have already registered for the conference but would like to purchase a ticket for a section breakfast, luncheon or field trip to my registration. How do I do this? Registrants will be able add and make changes to their registration online. A confirmation email is sent when changes are made using online registration. Additionally, you are welcome to use a paper registration form (PDF) to submit your changes. Paper forms may be submitted by fax or regular mail. Please email registration with any other questions or concerns. I have already registered but would like to add a program session, one that does not require payment. Is there an easy way to add this session? Yes, you can easily add sessions included in your registration fee using the online registration system or by sending an email to registration@aals.org with the unpaid sessions you would like to add. You will receive an email confirmation of the changes requested. Can my spouse or significant other attend the Annual Meeting? A spouse or significant other is welcome to attend with a law faculty or staff member who is registered for the full meeting. No additional fee is charged for your guest to attend non-ticketed program sessions. Guests will receive a badge from the registration desk upon check-in. Note that Institutional Advancement registration does not include the option to register a guest. Also, a spouse or significant other who is also a law school faculty or professional staff member cannot attend as a guest registrant, and must instead register individually through the standard registration process. I would like my guest to attend a breakfast or luncheon with me. How do I pay for their ticket? To purchase a ticket to a breakfast or luncheon event for your guest you may use the online registration system or submit a paper registration form (PDF) using the standard fax or regular mail processes described above. If using the paper form, please include the code for the ticket you would like to purchase for your guest and provide payment information at the bottom. You should also place your name on the form as the primary registrant, and include a notation in the “Registration Type” field that your registration has been completed previously. Can I purchase a ticket for my guest to attend a field trip? Field Trips have limited space and registration priority is given to law school faculty and professional staff. Tickets for a spouse or significant other may be available for purchase on-site, but are subject to availability. When is the AALS Orientation Session for First Time Meeting Attendees held? What day is the AALS Annual Meeting Opening Plenary Session? Yes, badges are required for entry into all Annual Meeting sessions and events. Although the meeting takes place indoors it is advised that you bring a jacket or sweater to meeting events, as meeting rooms can sometimes be cooler than expected. Additionally, this year’s Annual Meeting events are being held between the two co-headquarter hotels. While the hotels are located across the street from one another you may still prefer to have a jacket as you move between them. Starting December 22nd, please contact the hotels directly. Important: Please make sure you verbally confirm the room rate with the hotel as all hotels must honor the negotiated AALS convention rate if the hotel still has availability in the AALS block. Be sure to ask for “In-House Reservations” at all of the hotels. Where can I find information about the hotels online? Visit the Housing website (by clicking the “Hotels” tab on the left) for more information on the co-headquarter hotels (rates, restaurants, complimentary services, amenities, and check-in/out times), as well as travel tips, accessibility, and cancellations/refunds. A valid credit card with an expiration date of January 2016 or later is required to secure your room reservation. Credit cards will not be processed prior to your arrival. Your credit card will be charged one night’s stay plus tax if you fail to cancel before 6 pm on the day of arrival or if you do not to check in on your scheduled arrival date. Starting December 22nd, contact the hotels directly to change or cancel your reservation. If cancelling, be sure to do so by 6 pm on scheduled date of arrival to avoid being charged one night’s room charge and tax. One person should be designated to make the hotel reservation online. List all occupants when making the reservation, including children and their ages. Children under the age of 18 may stay free of charge in a parent’s room. There is an additional charge of $20 per person, per night for more than two adults (age 18 and above), sharing a room. To avoid this charge for guests under 18, who will be counted as exempt, you will simply notify the hotel at check-in. Visit the Housing website (by clicking the “Hotels” tab on the left) for more information on the co-headquarter hotels (rates, restaurants, complimentary services, amenities, and check-in/out times), as well as information on reserving a suite, travel tips, accessibility, and cancellations/refunds. Speakers and Section officers who have questions may ask in person at the AALS Information Desk or call 212-261-6177 for further assistance. Want to get the most out of the event? 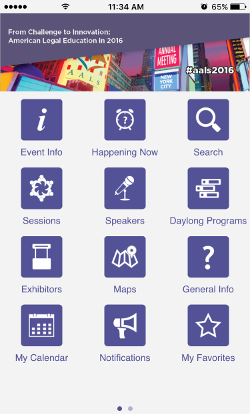 Download the AALS Annual Meeting App! Or search AALS2016 in the respective download stores.